obSEUSSed: You Can't Have Your Cake and Eat it Too! 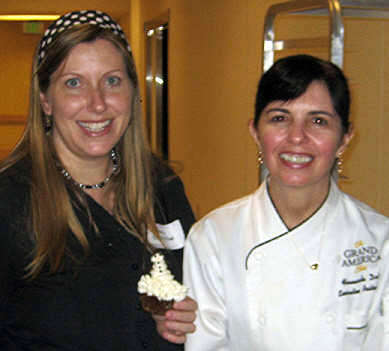 I attended the Seussalicious Cupcake Conference in Salt Lake City at the beautiful Grand America hotel this past month. It was an amazing conference for a group of Twitter/Bloggers who love cupcakes. It was great to meet faces of blogs I've read or people I've tweeted with. (Like meeting @LivingtheScream who realized I was her mom's neighbor and Emily Hill from "Is this Really My Life", see her post on #CupcakeConf). I also loved all the raffle giveaways and swag from different cupcake companies (and more listed on this site) and I can't wait to book the Fotofly session for my newborn. See more #cupcakeconf pics on my flickr stream to the right. They also had a cupcake decorating contest. They gave all the attendees a cupcake, bowls of pretty pastel frosting, a variety of tips and sprinkle elements then let everyone start designing. I created it just to have fun, not thinking I had a chance because after all, there were real bakers in the group and I loved all the other colorful designs. When the pastry chef picked my cupcake as the winner I was surprisingly shocked. I won a fun cupcake decorating kit from Orson Gygi (the kitchen supply store). Seussalicious Cupcake designed by Grand America's Pastry Chef. Ok, I have to confess. I was so excited I could not bring myself to eat it that night. #1 - it had too much frosting to eat it and #2 - I tried to take pictures of the cupcake but you couldn't really see the details and I wanted to show it to my mom who was at home tending the new baby, so..... do you want to know what happened to this prize winning cupcake? I put it in the small groove of my dashboard for the ride home and while I was rounding the corner of the 1-80 spaghetti bowl the snowman flew across the dashboard and splattered into the windshield. Oh man! I was not happy. I was only minutes from home and had saved it all night just to show my mom. I think I needed that to happen to help humble my winning ego. When I walked in the door I thanked her for watching the kids and told her I won the contest. She asked if I brought the cupcake home to show her and I said, "I already ate it," too embarassed to tell her what really happened. I can't wait for the next cupcake conference (which is currently being planned). But just remember what I learned: You better eat a good cupcake as soon as you get the chance because if you hold onto it, it might splatter on the windshield. Or in other words: You can't have your cake and eat it too. (I apologize for lying mom.) This is the cake I made for my mom "The Cookie Monster" back in May. Ah ha ha ha. I just laughed OUT LOUD...not because you lost your cupcake when it smooshed all over the windshield, but because you told your mom you had eaten it! Awesome. I am glad that you came to Cupcake Conference. It was fun hanging out with you. I loved meeting you! Such a small world thanks for the shout out! Your cupcake was awesome and it's so sad it didn't make it all the way home! I loved your snowman cupcake. So cute!